How to get there: The starting point is the small village of Leogang. Leogang is located south-west of Salzburg, perhaps the easiest route would be to follow Hwy. 21, then 312 and 311 to Saalfelden, starting out west of Salzburg (on E-52), then heading south. Leogang is 8 kilometer west from Saalfelden. In Leogang, turn right immediately after a cafe, this is the main side road serving the small village. Bear left after 0.5 kilometer and follow signs that says Passauer Hütte. About 2.2 kilometer from the Hwy. you will see a big trailhead sign on your right. There is parking on either side of the road. Park here, location N47.45275, E012.75552, elevation about 875 meter. To the Passauer hut The trail first crosses the local creek, then runs by a local barbeque area. Pay attention to the signs, the trail to Passauer hutte forks sharply right and runs up the nearby hill. From now on the trail keeps climbing a very distinct ridge with many switch-backs until it is close under the steep cliffs that can be seen higher up. There is a storage area for firewood just before the trail leaves the big trees behind. Hikers are encouraged to bring up some wood from here. Higher up, the trail gets somewhat steeper and more exposed. It has been equipped with a rope (actually steel chain wrapped in rubber) and artificial steps made from cement have been put in place. Thus, under normal conditions this trail is suitable for most hikers. The trail proceeds to zig-zag just left of a distinct gully, crosses to the right and then reaches a nicely formed mini-ridge from where one can see the Passauer hutte even further uphill. A traverse followed by a final zig-zag climb finishes the route. There are two routes, however only one will be described here. Cross the large, gently sloping field behind the Passauer hut, while traversing right. Ascend gradually in order to turn a rock ridge that comes down from the mountain (on your left). Continue to cross the new bowl like slope beyond the rock ridge. Measure your distance back to the Passauer hut. 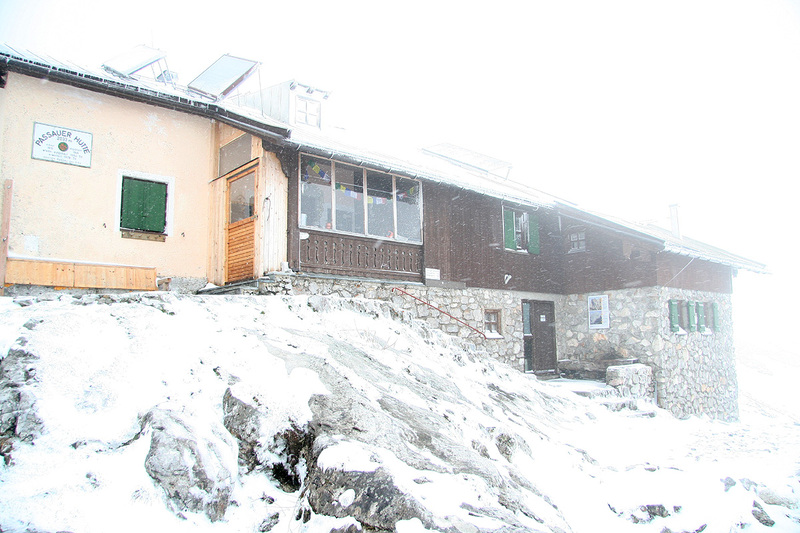 When you are about 1.3 kilometer (straight line) from the hut, seek left and look for the route. 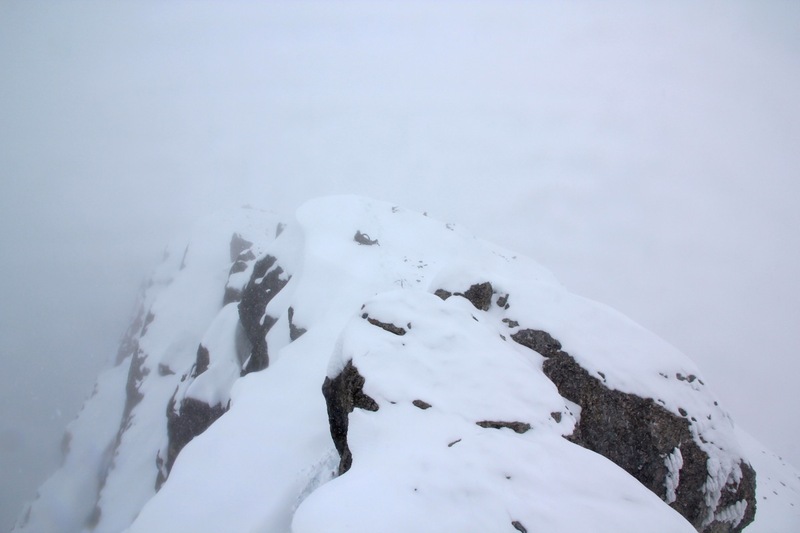 The new route to the top ridge is further right, beyond a second rock spur. 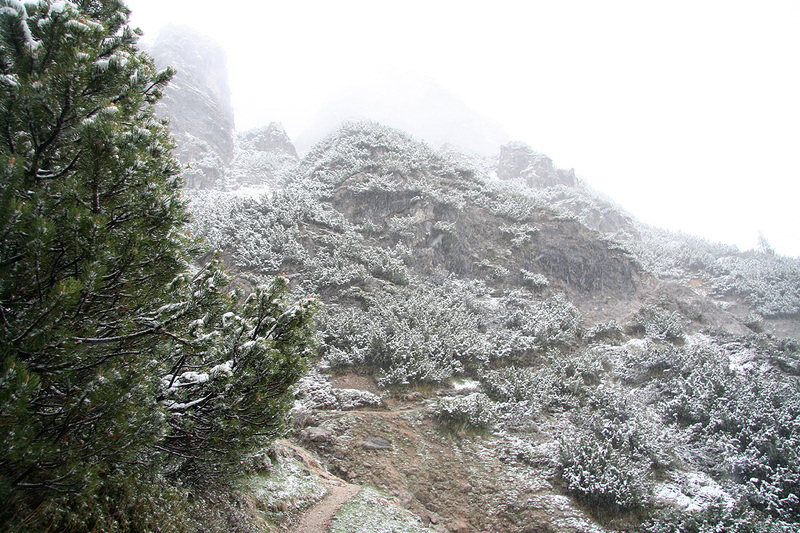 The old route is not recommended in summer, but in winter conditions it may be ok. The two routes are protected by some cable (in summer), these may be buried in winter. The two routes meet half way up the face, then proceed uphill on more gentle terrain to the col at 2437 meter, between Birnhorn and Kuchelhorn, 2500m. The route now turns left. In summer, this is most likely obvious (red paint), however, in winter conditions things were less clear. We proceeded to follow the highest ridge or the highest, broad ledge on the right hand side of the crest. This leads to a small plateau followed by a pretty distinct notch in the ridge where the main ridge is fairly narrow. 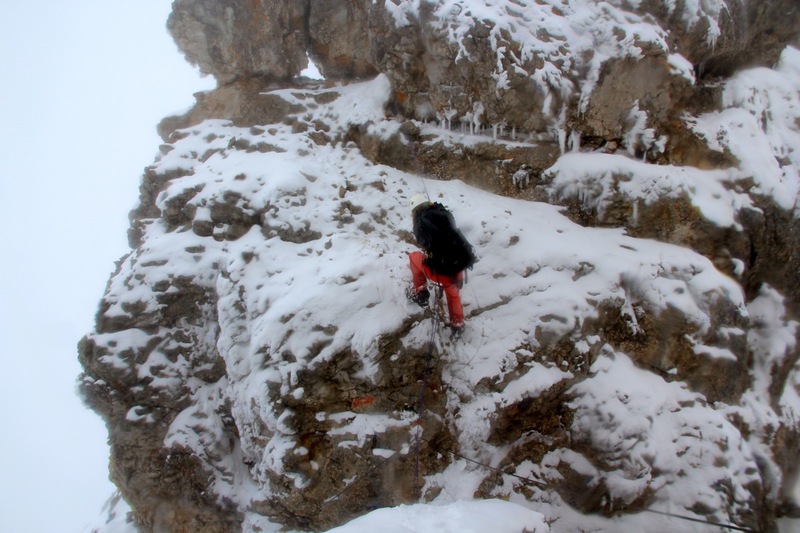 In winter conditions, the descent to this notch is non-trivial. 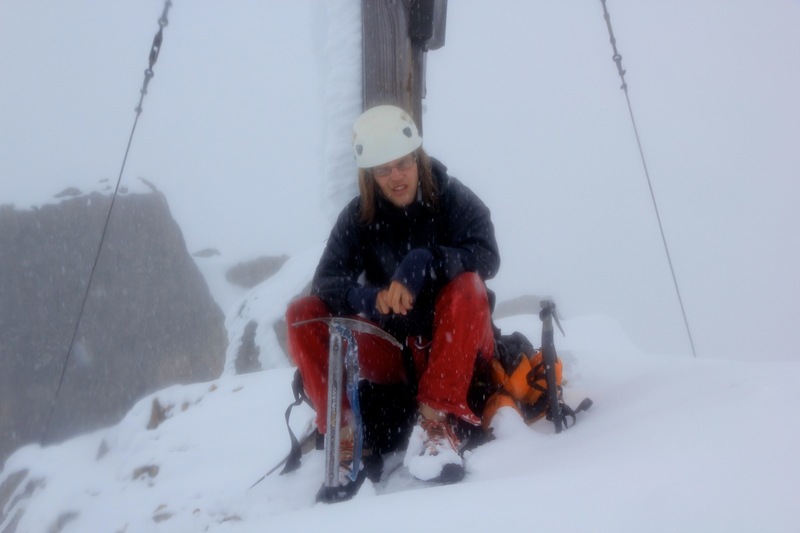 The notch itself as well as an easy onward route on a broad ledge, is well protected by a cable. It is very likely that the route actually comes up to this notch from the right hand side of the mountain, but we could not confirm this with certainty. What is definitely true is that the descent to this notch is the crux of the route that we followed. From here, the route follow broad ledges that nicely climbs and eventually tops out at the top ridge a bit beyond the summit. 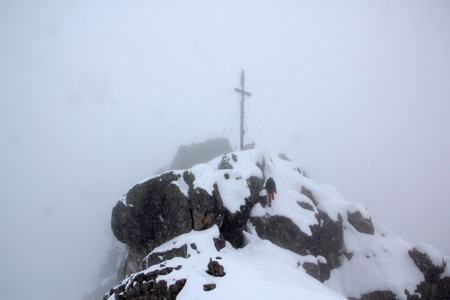 Turn left and scramble the last few meter to the summit cross. 31. 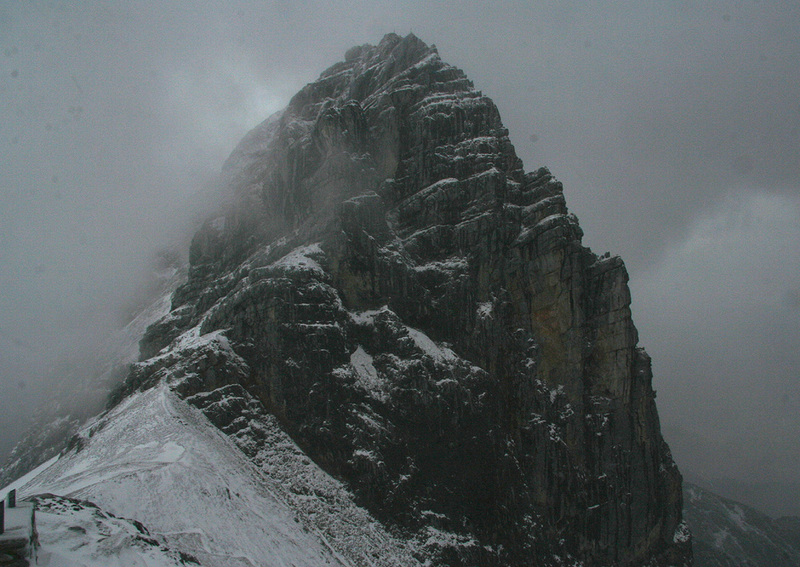 May, 2010: We had dinner in Leogang, then started out at our second hike of the day. The time was 1725, pretty much according to plan, we should arrive before 2100 at the winterroom of the hut, before it got dark, but with no more to do than sleep. The weather looked wet and before long we had some solid showers, including one that carried hail. We set a slow, but steady pace knowing that we would arrive before 2100. Picking up firewood at about the half way mark, we were getting used to this service. The day before, we had carried 10 liter of water for a hut, this time it was firewood that was in short supply higher up. The trail got somewhat more exposed as we entered the rock, however a lot of work had been done in order to keep this trail quite accessible. Steps had been made and cable attached to the rock, overall, this trail is quite impressive. We got the hut in sight and arrived in precisely 3 hours, at 2025. After some initial trouble, we got the wood burning oven going and organized ourselves within the two available beds. The place was well equipped with beer for thirsty hikers, subsequently we went to bed, hoping that the weather would show signs of improvement. The next morning turned out to be quite the opposite. The temperature had dropped and it was snowing. Quite a bit had already accumulated during the night. Add that there was significant wind and a complete white-out with respect to visibility, our options were few: Either stay another day and try a summit push on Tuesday, or descend before the steep and exposed trail becomes really tricky. It turned out that we had mobile phone coverage, Åke could therefore access the Internet and get an updated weatherforecast. Unfortunately, there were no signs of an improving trend. This effectively reduced our options to one: Descend before the conditions make even this a troublesome affair. 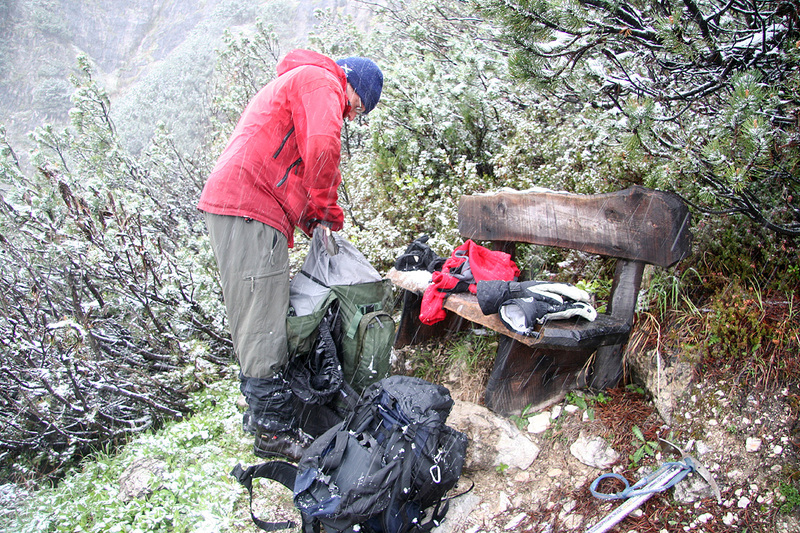 We left the hut at 1040, the first section had to be negotiated rather carefully because of the snow. Everything went smoothly and we returned to the car by 1255. I drove Åke to the railroad station in Garmisch before continuing to my destination in Kleinwalsertal. 28. June, 2013: Pål Jørgen and I flew via Copenhagen to Munich on Thursday, June 27. Holiday Autos had done a poor job by signing up with a car rental company that was off-site, despite my request to rent from the airport. Caro rental car seemed quite amateur like, they did not meet us as promised. When called they insisted we were in the wrong location which we were not. When the car finally arrived, about 45 minutes late, the paperwork was carried out on top of the car. We arrived at the trailhead parking in Leogang around 1645 and were ready to hike by 1700. 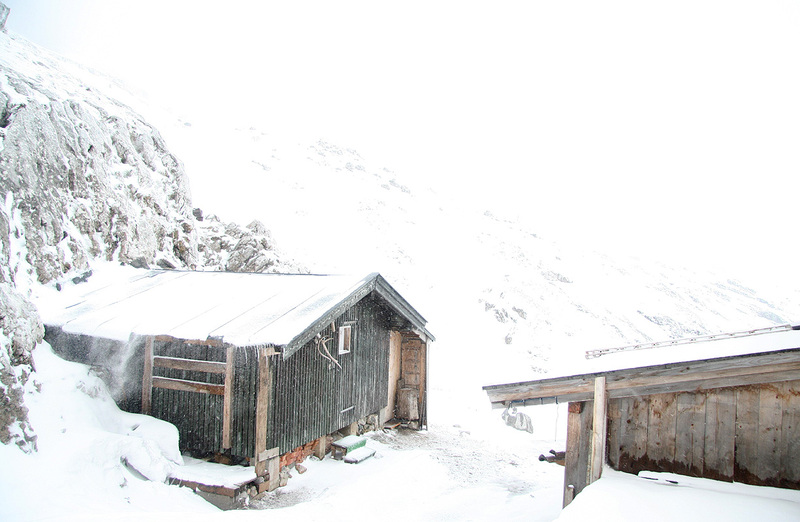 Pål Jørgen set a steady uphill pace and we arrived at the Passauer hut precisely at 1900. A warm and friendly welcome, it turned out that we were the only guests - flexible time for dinner. We enjoyed a nice dinner and a couple of beers plus the hospitality snaps. The hut manager, Evelyn, was exceptionally nice and friendly, a visit to this hut is highly recommended! The next morning, we had breakfast at 0700 and left the hut by 0745. Completely white-out! We headed slightly uphill, then more of a traverse. Soon, we were in pretty deep snow. Not at all easy to see where the route went. I knew that we should seek uphill about 1.2 kilometer from the hut. 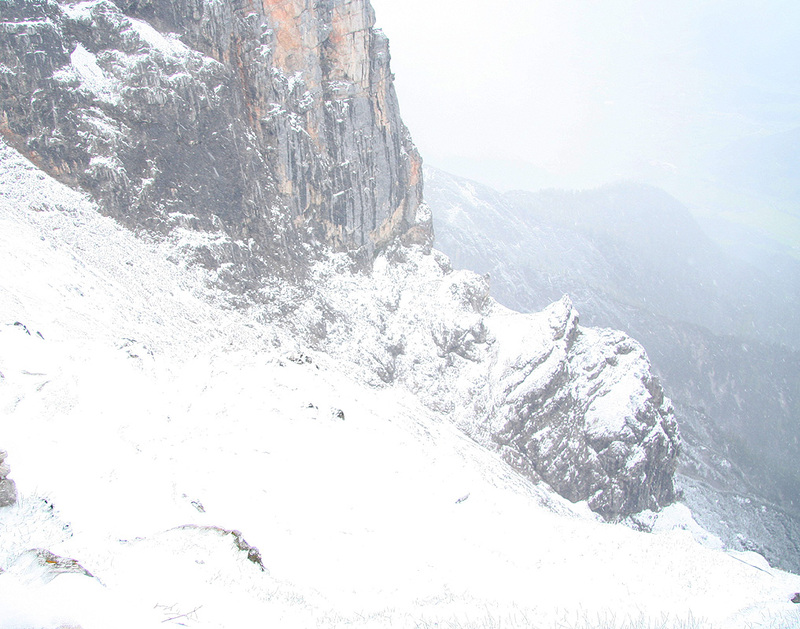 We explored a snowfield that ended in some ledges, but decided that this was not it. Further right, around a local corner, we explored a new snowfield that went uphill slightly steeper higher up and ended in a narrow gully. There, I spotted some cable and a few markings with red paint. We knew that there was an old route and a newer one further right, which one had we found? No easy way to tell, we headed uphill along the route that we had discovered. Most of the possible protection was buried under snow, but the route looked quite ok. We proceeded uphill and ran into a sign pointing downhill to our right, saying "Neuer weg", hmm, obviously we had ascended the old route. 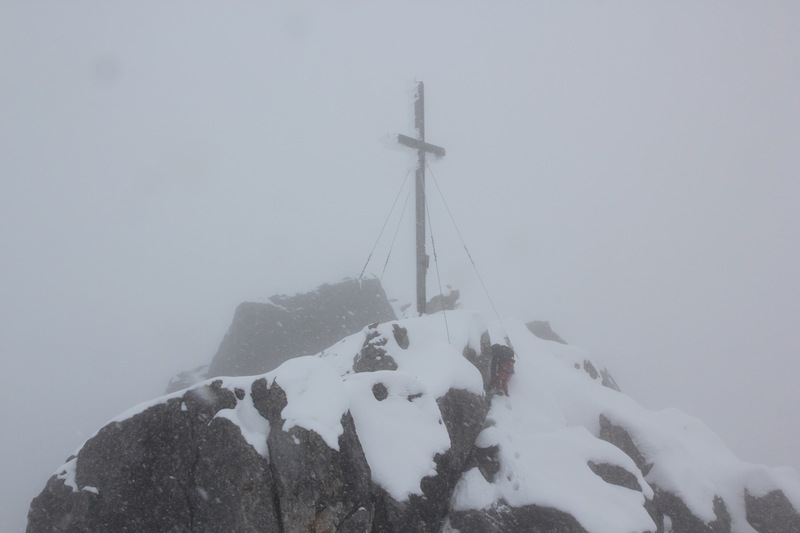 The rest was easy and soon we gained the main crest having another sign and stating an elevation of 2437 meter. 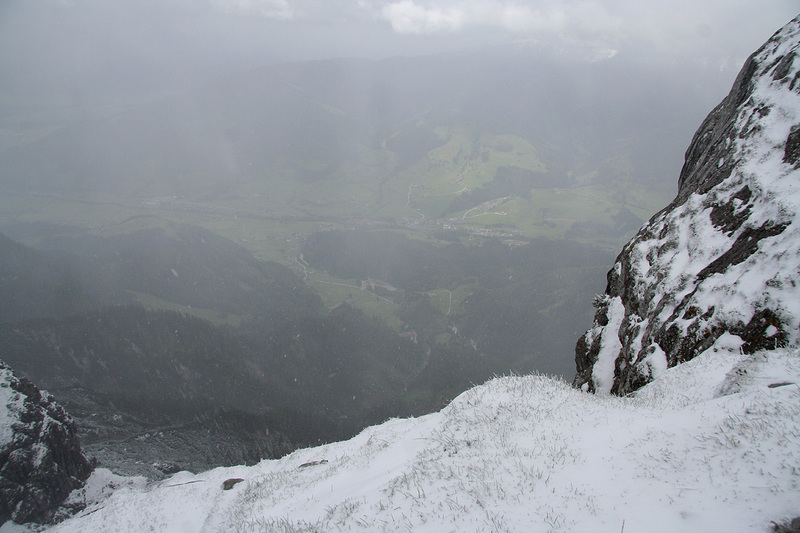 We were in the col between Birnhorn (left) and Kuchelhorn, (right). From here, we believed that the route would follow the ridge to the summit. In practice, we stayed mostly a bit right of the ridge crest, following good ledges. However, we soon came to a significant notch, a pretty deep cut in the ridge. At the bottom of this crack, we could see a cable that clearly showed us that the route was there. In fact, it seemed that the route came up from the right hand side. We returned some ways back in order to explore if we could follow a lower ledge that would lead us into the crack. No such luck. 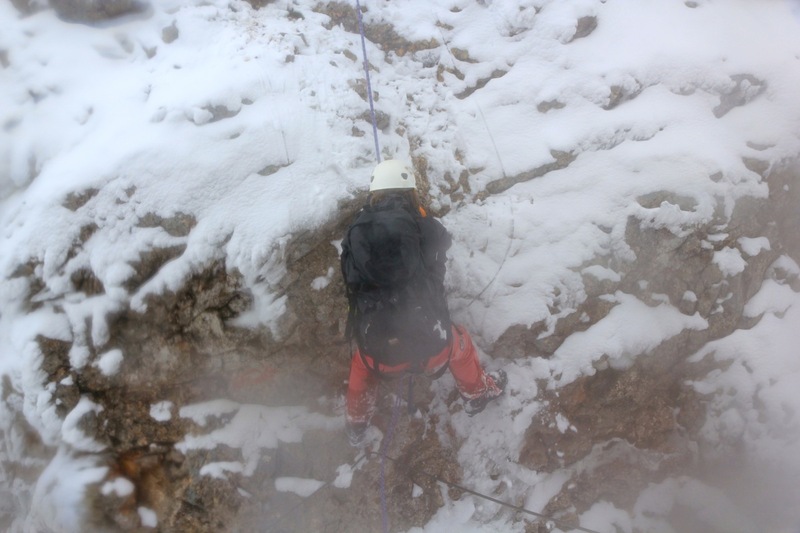 We then returned to our previous place and decided to use our short rope to protect a descent into the notch. 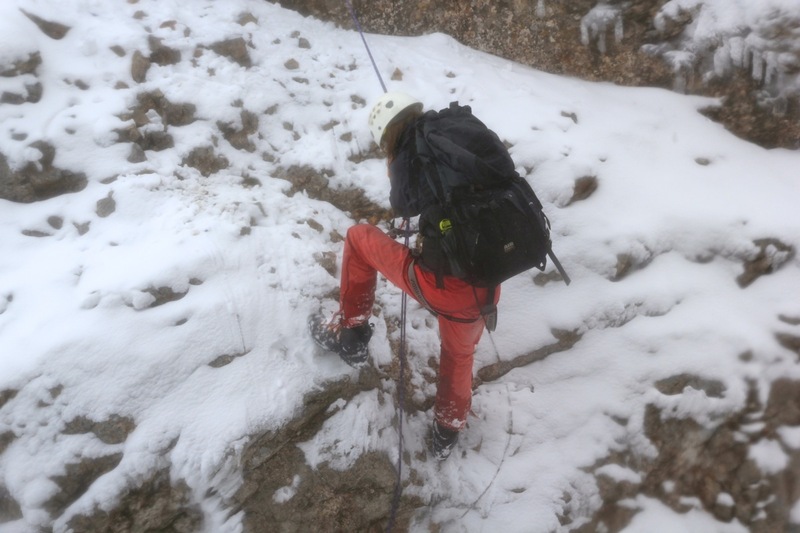 We chose to leave the rope in place and use it for our return climb. The rest of the route was pretty easy to follow and by 1200 we were both at the summit cross. Leaving at 1230, we retraced our steps and climbed back out from the notch. We decided to follow the same route on descent, mainly to save energy by stepping in the same deep holes that we had made on ascent. We were back for a well deserved lunch at 1400. What had taken 4.5 hours to climb could be reversed in only a third of the time. We said goodbye to Evelyn and started our descent at 1515. The trip down to the car parking took 1.5 hours, thus we were back at our car parking by 1645. 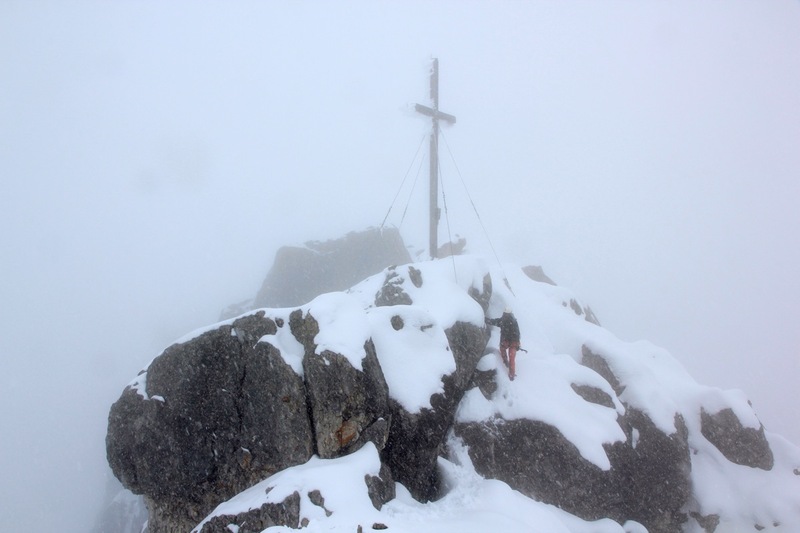 We now continued in order to prepare for a climb of Birkkarspitze. Hut view, the parking below and Leogang. A nice peak, just below the hut. View from the hut, our route to Birnhorn should go this way. Our route, traverses from here to the white saddle. Below the snow, putting away winter gear. The last steps to the summit. 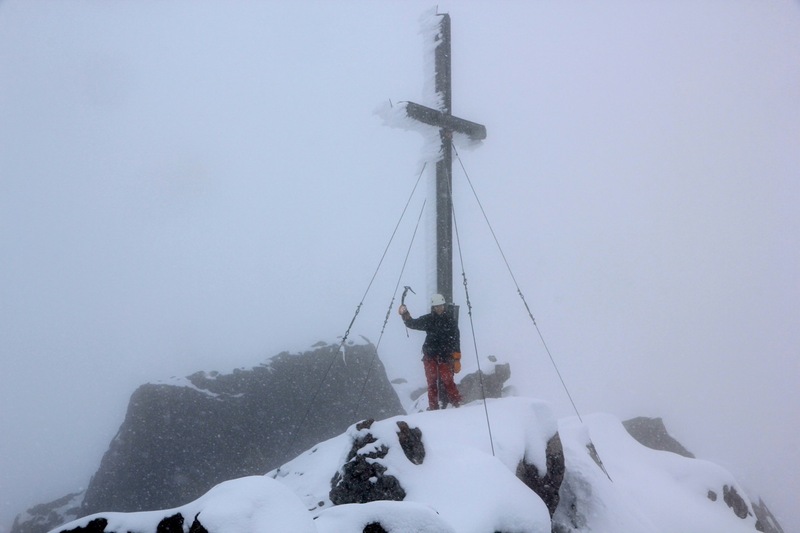 Pål Jørgen at the summit of Birnhorn.